•When you are asked, "Paper or plastic?" say, "FABRIC!" 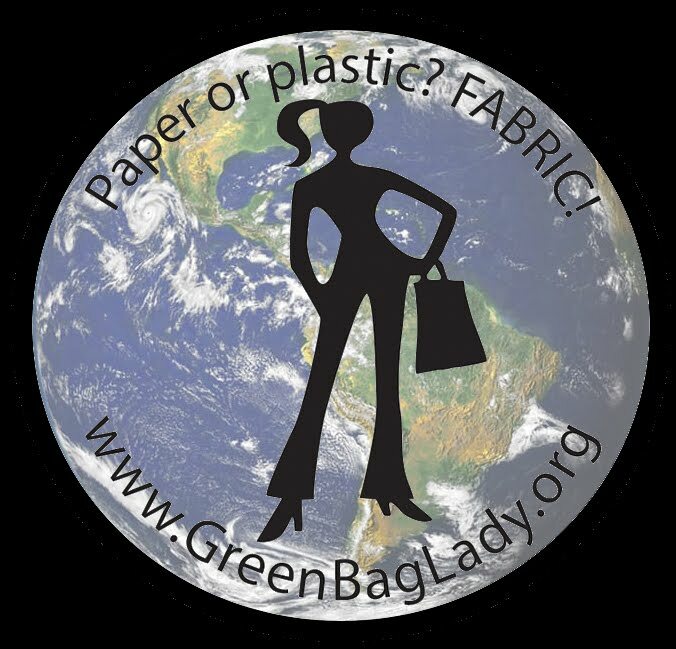 •Use your Green Bag Lady bag and buy more fabric bags at the grocery for your other stuff! •If you forget your bags in the car and are already at the check out, just have them put your items back in the cart and bag them in your fabric bags once you get to your car. •Not just for groceries. Use them for all your shopping, even the mall! •Leave your bags in the car so they are always with you. •After you unload the bags in your home, hang them on the door knob so you grab them on your way out the the car. •Find alternatives to wrapping paper. How about wrapping a present in newspaper, magazine pages OR a fabric bag! •Turn your AC temp up 2 degrees. It makes a big difference environmentally AND you will notice the difference on your monthly bill as well! •Please stop buying bottled water. Please. Most of the bottles end up in a land fill instead of recycling AND you can get a great/fun refillable water bottle instead. My whole family has SIGG brand aluminum bottles and we LOVE them. •Buy LOCAL as much as possible.